Posted on July 29, 2011 7:12 AM by Lana N.
Easy peasy. No more looking up phone numbers or asking the Capitol operators who your representative is. No more cradling the phone on your shoulder while you're on hold. Now you can finish up some work, play Solitaire, or check Facebook while you wait.Now that it's this easy, get on the phone computer and call Congress now! Posted on July 28, 2011 3:15 PM by Lana N.
On the United States Capitol steps today, with a looming federal government default and several proposals on the table to balance the budget by gutting vital programs, an estimated crowd of 450-500 assembled to show their support for preserving Social Security, Medicare and Medicaid in any budget negotiations, now or in the future. They also demanded that if we're looking for funds to balance the budget, the best place to look is in the bank accounts of Wall Street banks who are making record profits after benefiting from massive bailouts, and from the wallets of hedge fund managers who pay a lower effective tax rate than their secretaries.MoveOn.org, Rebuild the Dream, AFSCME, AFGE, and Jobs with Justice, among many other organizations came together to organize the rally today. Among the speakers were Van Jones, co-founder and president of Rebuild the Dream; Co-Chairs of the Congressional Progressive Caucus Rep. Raul Grijalva (D-AZ) and Rep. Keith Ellison (D-MN); Reps. Jan Schakowsky (D-IL), Barbara Lee (D-CA), Sheila Jackson-Lee (D-TX) and Donna Edwards (D-MD); unemployed Army reservist Tiffany Mellers; furloughed FAA worker Ralph Randall, Jobs with Justice president Sarita Gupta, and national president of AFGE John Gage.Van Jones was both a featured speaker and the rally's emcee. He started off the rally by pointing out that the mainstream position in America is that rather than looking first to raid programs like Medicaid, we should consider wealthy people part of this country and look to them to help shoulder the burden.To me, the most impressive speakers were those who are not practiced public speakers and who are not representing the unemployed and disadvantaged, but are themselves at the mercy of the current debates in Washington. Tiffany Mellers spoke about the difficulty she has had finding work as an Army reservist returning from deployment and of the inherent unfairness of thousands of Army reservists who have put their own bodies on the line, only to return to no job. And Ralph Randall talked about being caught as an FAA worker in the GOP's zeal to eliminate collective bargaining rights; he is out of work as the Republicans have partially shut down the Federal Aviation Agency.The Congressional representatives gave fiery speeches defending Social Security, Medicare and Medicaid. John Garamendi (D-CA) exclaimed that we know under the Boehner bill that "Medicare will be terminated, and we will not let that happen!" Sheila Jackson-Lee (D-TX) implored the crowd that it was "time for you to fight for those who cannot fight for themselves!" Rep. Donna Edwards (D-MD) emphasized that "we're not going allow to America default on its obligations while we say to our Social Security recipients, women, seniors, children who have lost their parents, veterans, that we are going to reach into your pocket instead of reaching into the pocket of those who have gotten away with everything. That is not our America, that is not our dream! "Those who attended the rally were energized and hopeful that progressives in Congress would be able to hold the line and defend key programs while making sure the rich paid their share. The crowd stayed energetic throughout the rally, despite the heat, and joined in a massive chorus of "This Land is Your Land" to close the rally.We'll have more media from the rally over the next day or so, Until then, you can look through the large photo slideshow available on Flickr at the top of the page. Posted on July 28, 2011 8:24 AM by Lana N.
Our emergency default crisis rally at the US Capitol will be broadcast live here at 12 noon ET. Stand by for Van Jones, Congressional Progressive Caucus Co-Chairs Raul Grijalva and Keith Ellison, unemployed Army reservist Tiffany Mellers, and furloughed FAA worker Ralph Randall, among others. Posted on July 27, 2011 5:20 PM by Lana N.
Posted on July 27, 2011 2:48 PM by Lana N.
Protestors in opposition of the U.S. debt-ceiling stalemate are lined upoutside of Congressman Ted Poe’s Kingwood office. By noon Tuesday, around 46 people were lined up outside Poe’s office for a protest and counter-protest. 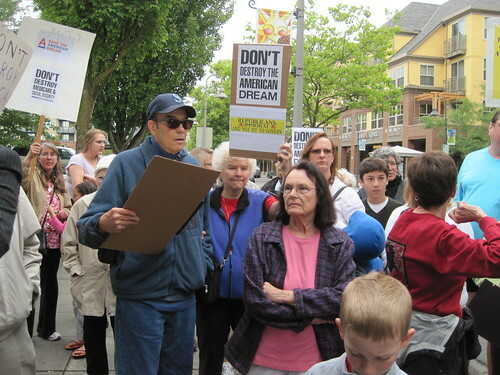 A group stood holding picket signs expressing their views and demands, which included protection of Medicare and Social Security. One participant noted none of the congressman's aides were in the office when they gathered for about an hour. Protesters complained that Republicans have steadfastly resisted taxing the wealthy while pushing for cuts in programs that help low-income Americans. They criticized Sen. John Barrasso as well as Lummis. Protesters said they were frustrated with Lummis for what they described as her unwillingness to compromise with Democrats. The group stood on the sidewalk soliciting honks of support for Medicare, Social Security, jobs and public education at noon today. Then they marched up the two flights of stairs at the Thames Plaza on Water Street and into Courtney's office. Contois told the group she could not answer whether Courtney would sign the Progressive Caucus letter, but he did sign a letter with 32 other members of the Congressional Task Force on Seniors on July 15 urging Obama to reach a deal to avoid defaulting on U.S. loans while keeping a "commitment to the well being of older Americans." "Time for Washington to grow up and do its (expletive) work." That was a typical posting that appeared on a Twitter feed. All over Capitol Hill, members of Congress reported that their websites were slowed or even knocked out by the flood of emotion. More than 50 people of sharply-varying political stripes massed outside of Republican U.S. Rep. Jon Runyan's office in South Jersey. “We want the Republican Congress to vote to make a compromise,” said Truscha Quatrone of Montville. Many chanted "raise the debt ceiling," while others waved signs reading "Holding America Hostage" and "Save the American Dream". Linda Lee is a 65-year-old teacher. She said she's afraid because she'll soon be eligible for Social Security, and she's uncertain how it would be affected if the debt ceiling isn't raised. "My mother ... would not be able to make it if she didn't have hers (Social Security)," Lee said. "It's a scary time. I've got our country in my prayers." Again, this is just a small sampling of the news coverage out there by local stations. Let me end by saying that I think it's great that local news outlets showed an interest in how their local citizens are expressing themselves politically. Posted on July 26, 2011 6:04 PM by Lana N.
The phone calls have already been pouring in, but even with today's success, we really need to keep the momentum rolling with phone calls to your representatives to make it clear that that Social Security and Medicare should not be sacrificed to save big tax cuts for the wealthy. The number for the US Capitol switchboard is (202) 224-3121 if you haven't called already. Ask what your representative's position is, and if they pledge to oppose cuts, thank them. If they want to force cuts in order to make a budget deal, or they're not sure, tell them very firmly (but politely) where you stand. On a normal day, even in tense times such as these, congressional district offices do not get a whole lot of visitors. They are generally located in quiet, out of the way places in strip malls, office parks, and small high-rise buildings. But today, thousands of Americans across the country said enough is enough. The people of this country are sick of their representatives in Washington playing games while millions still suffer without jobs. They're sick of politicians who will never have to worry about paying for retirement going after the American people's pension plan and retirement health insurance, Social Security and Medicare, while they give even more tax breaks to the superrich and forcing the American government to the brink of default to get their way.I knew today was going to be big when my friend Cara e-mailed to tell me that "my mother called last night to tell me that she is going at noon to the protest at Rep Tom Reed's office [in New York State]. My mother. She has never been to a protest and has never been plugged into the activist community." Of all the crises that have occurred in this country over the last few decades of her mother's life, the urgency of threatened cuts to some of the most vital supports for the middle class compelled her to show up today.Here's just a sample of what happened today, because I couldn't possibly cover 435 events in a single blog post:Ohioans protested against Rep. Steve Stivers' insistence on cutting vital programs like Medicaid before he would agree to keep the government out of default. They made their way in to talk to his office staff, and in a powerful moment, one woman shared her the story of her father, who in an emergency had to turn to Medicaid (which he qualified for) after his private insurance cut him off. Watch the video: In New York, over 50 protestors eventually met with the staff of Republican Nan Hayworth, but not before her office tried to shoo them away by calling the police. 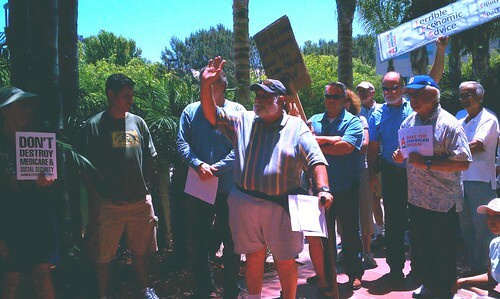 In California, 70 people showed up at Republican Brian Bilbray's office, eventually getting a meeting with his aides outside. Crowds gathered outside Washington Republican Dave Reichert's office, and his deputy district director listened silently as the crowd spelled out their concerns very clearly. In Pennsylvania, an estimated 80 people showed up at Republican Mike Fitzpatrick's office. They were so fired up about the turnout that they decided to meet up tonight to talk about what else they could do to make sure Social Security wouldn't be sacrificed to the whims of Tea Party Republicans. 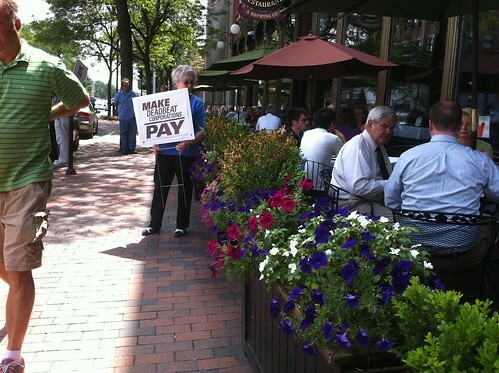 In New Hampshire, protests in front of Republican Charlie Bass' office spilled out next to a sidewalk cafe, where one Newt Gingrich was having his lunch. In Arizona, 40+ protestors braved 106 degree heat outside Republican David Schweikert's Scottsdale office to ask him to raise the debt ceiling with clean vote instead of targeting Social Security and Medicare. 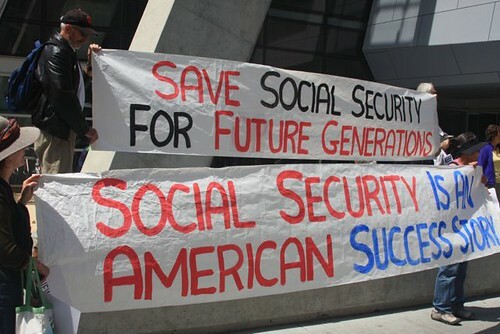 One of the younger attendees held up a sign with hope for their own future: And people coming out to defend Social Security didn't just target the offices of Republicans, or Democrats on the fence. In Missouri, they showed up at both local district offices to thank Emmanuel Cleaver and his staff for proudly signing the CPC letter defending against cuts. In New York, they showed up to thank Jerry Nadler. In Houston, TX, they visited with the staff of Sheila Jackson Lee. In Georgia, dozens showed up to ask Hank Johnson to be even more visible in demanding that the rich pay their fair share. And so on across the country.Watch out for more updates on what happened today, as well as how you can get involved in the coming days! 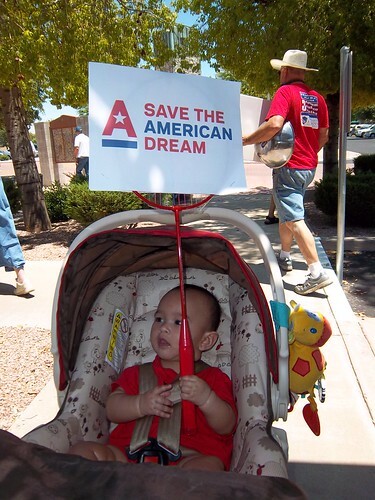 Posted on July 26, 2011 11:50 AM by Lana N.
Don't Destroy the American Dream! Posted on July 25, 2011 7:26 AM by Lana N.
To all allies of the American Dream Movement, we need you to stand side by side with us on Tuesday.We're all perched right on the edge of the precipice right now, folks. If Congress does not authorize raising the debt ceiling in the next week and a half - something they managed to do without controversy 19 times during George Bush's two terms in office - Social Security checks could stop rolling out to seniors, millions of workers could be furloughed, interest payments on government bonds could halt, crashing markets worldwide. Loans for college, business startups, and homes would be very hard to get. And the government would have to pay a higher interest rate on all debt, squeezing the budget even further.All of these add up to one thing - our fragile economy plunging back into an even deeper recession.To conservative leaders in the House of Representatives, this nightmarish turn of events is perfectly acceptable as long as they can keep the top 2% of the wealthiest from "tax increases", even if that only means letting the Bush tax cuts for the wealthiest expire. Their own plan, which includes hacking away at Medicare and Social Security while lowering taxes for the wealthy even further, doesn't even come close to balancing the budget!That's why we're calling on all Americans to stand up for the American Dream at your local House district office this Tuesday at noon. The only way that Congress will listen is if we stand up and demand to be counted. Your congressperson needs to hear directly from you and your fellow constituents that any and all cuts to major programs as part of this conservative-manufactured default crisis are completely unacceptable.It doesn't matter if your own representative already stated their opposition to cuts for Social Security, Medicare, and Medicaid as part of a deal to avoid default. If they've stood up to defend the great programs that launched the largest expansion of the middle class the world has ever seen, that's great! You still need to rally at their office. They need to be thanked for doing the right thing.And if they haven't voiced support one way or another, we need them to know that they have to do the right thing and hold the line against cuts.We'll be standing up for the American Dream on Tuesday at noon. Will you be standing there with us? Posted on July 25, 2011 6:32 AM by Lana N.
Here's a quick walkthrough of how to find the closest congressional district office for your representative on Congress.org. Click here to begin.Enter your ZIP code. Click on your congressional representative. Make sure that it's your congressional representative and not your Senator or state legislator. Click on the Contact tab for your representative. Once you've taken those steps, you should see your representative's local district office address. Some representatives have two district offices, so go ahead and click on "More District Offices" just to make sure you see all your options.